Instant Pot Spinach Dal or as it is popularly called in India – Dal Palak. 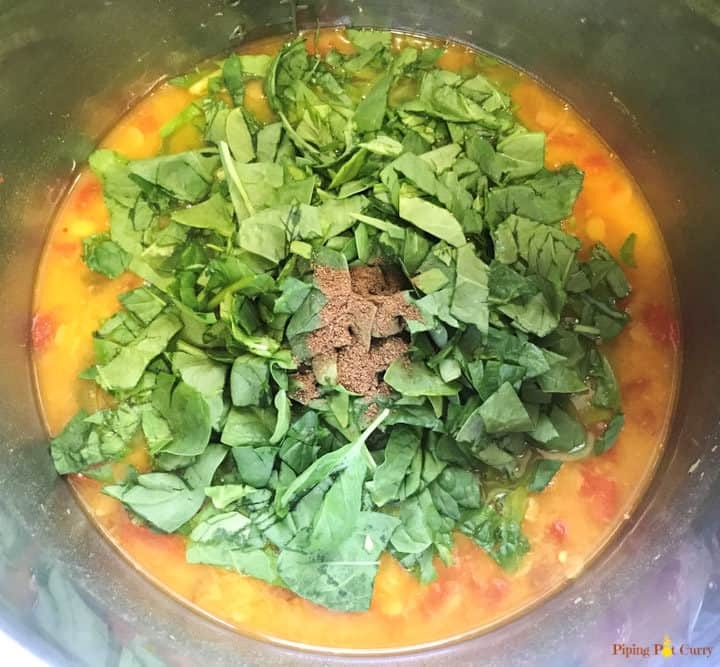 This is a comforting lentil soup with spinach mixed in it for extra nutrition. Making this in the pressure cooker is a snap. Enjoy it with basmati rice or as a soup. 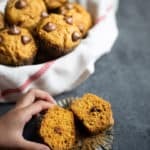 This is a Vegan & gluten-free recipe. 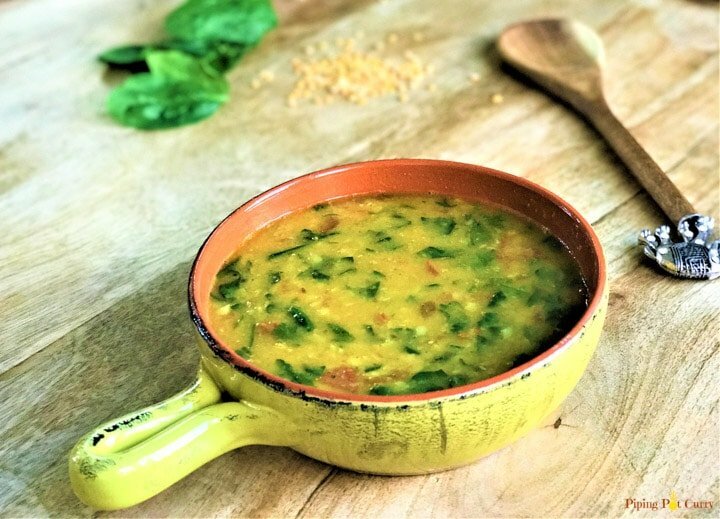 I love this lentil soup as it packs the nutrition of lentils and spinach in a single bowl. 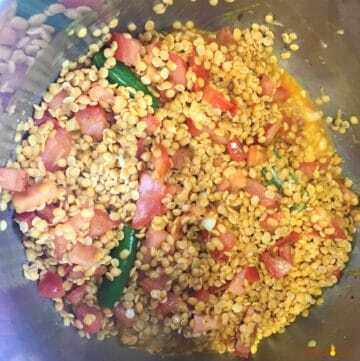 I used split pigeon peas or Toor dal, which packs 20gms of protein in 1 cup of cooked dal. Spinach provides a variety of vitamins and minerals. Give this dal a try and I am sure you will make it again…and again! I used Toor dal or Split pigeon peas for this recipe. 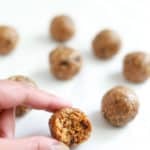 You can vary the lentils you use – masoor dal or red lentils or a combination of these. Don’t forget to check out my post for 29 Best Instant Pot Vegetarian Recipes. 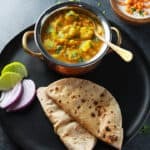 How to make Spinach Dal in Instant Pot? Start with heating ghee or oil in the instant pot insert and add the tempering ingredients – cumin seeds, ginger, garlic and green chilies. 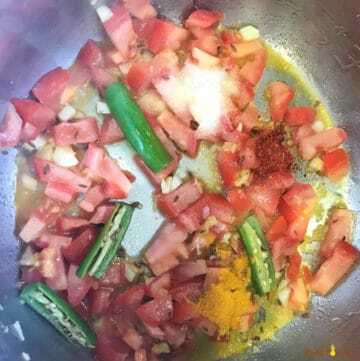 I usually use homemade ghee when making dal, but for a vegan variation use any plant based oil. Then add the tomatoes and spices. Then the washed lentils. Now we are ready to pressure cook for 3 minutes at high pressure. I add spinach after the lentils are cooked. Lentils take longer to cook and I don’t like my spinach overcooked, so I add it after cooking the lentils. When the pressure cooking is done, open the instant pot lid and add the chopped spinach and garam masala. Stir well and let it simmer until the lentils comes to a boil, about 2 minutes. At this time, the spinach would have mixed well with the lentils. 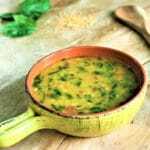 How to make Dal Palak in Pressure Cooker? Traditionally, Dal was cooked with salt, then tempering was done separately in a pan. Here I suggest a one-pot method, so the dal and tempering with ginger, garlic, tomatoes cooks along with the lentils. The main difference from the above method for instant pot is the pressure cooking time on stovetop. We will pressure cook on high flame until two whistles, then switch off the flame. Then let the pressure release naturally by itself. Everything else remains the same. You can add some lemon juice for a tangy taste. Enjoy the Spinach Dal with rice or just as a soup. I had this spinach dal with rice and then leftovers the next day as a soup. 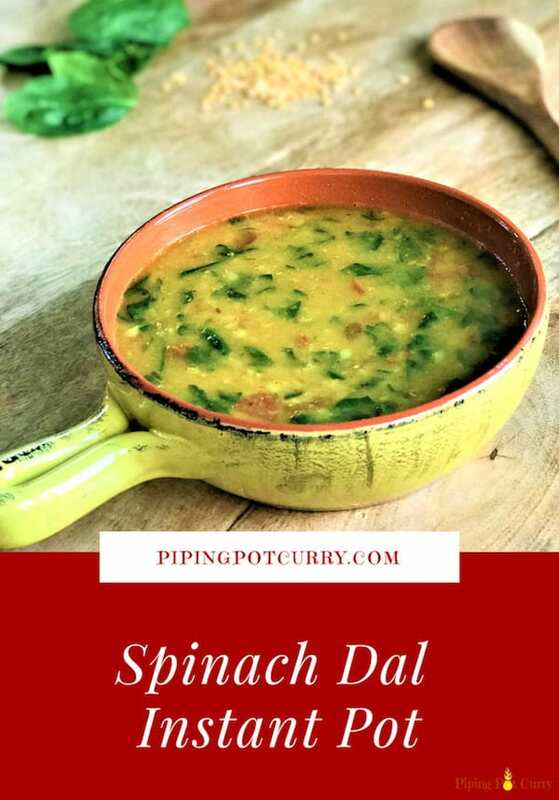 Try this Spinach Dal and let me know how it turned out. Leave a comment below. If you like this recipe, you might like other lentil recipes – Mango Dal, Dal Makhani, Green Moong Dal or Dal Tadka. A comforting lentil dish with added spinach made in the Pressure Cooker. Enjoy with rice or as a soup. Start the instant pot in SAUTE mode and heat oil in it. 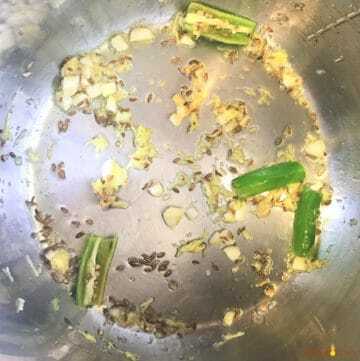 Add cumin seeds, green chili, ginger and garlic. Saute for 30 seconds until garlic turns golden brown, then add chopped tomato and spices. Add the lentils and water. Stir well. Press CANCEL and close the instant pot lid with vent in sealing position. Press MANUAL or Pressure Cook mode for 3 minutes. When the instant pot beeps, do a quick pressure release. Open the lid and add chopped spinach and garam masala. Press SAUTE mode. Simmer for 2 minutes until the dal starts boiling and spinach is mixed with the lentils. Heat oil in the pressure cooker on medium-high flame. Add cumin seeds, green chili, ginger and garlic. Add the lentils and water. Stir well. Cover the lid, turn the heat on high flame and pressure cook it until your hear two whistles. Turn off heat and let the pressure release naturally. Open the lid and add chopped spinach and garam masala. Turn stove on and simmer for 2 minutes until the dal starts boiling and spinach is mixed with the lentils. You can use only toor dal or only masoor or equal quantities of both. If using another dal, the cooking time may vary. Vegan variation: Use oil when tempering in step 1. I loved it. 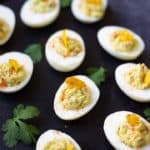 Such a simple recipe and I was glad I did not have to cut onions. 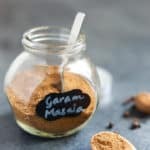 I was wondering why you did not use ‘hing’ (asafoetida) in the recipe? I did add it in since my baby who will be eating this might get gassy. This recipe was delicious and the proportions were just right. The daal consistency was perfect. Hi Manjini – Glad you enjoyed the Spinach Dal. Many times I skip hing as according to some scholars, it is considered a negative energy ingredient. I know it is such a common ingredient used in Indian cuisine for tempering, so I do use it but sparingly. I agree it can help with digestion. Thank you for sharing back your review! Just made this dal w/ masoor and a mix of kale & spinach. (All I had on hand.) I also added extra garlic. Turned out great! Thanks! Hey Jules – Glad to hear you enjoyed the Dal. Kale and spinach blend works great! Hi Catherine – You can do 4 hours on high to make this dal in a crockpot. Just add in all the ingredients before the pressure cooking step, and set the crockpot on high for 4 hours. Then add in the spinach and Garam Masala. Hope you enjoy it!